With one hashtag, the community of Cherry Hill High School West turned a school donation drive into a community happening. Over the past few weeks, everyone from Cherry Hill Public Schools Superintendent Joe Meloche to Mayor Chuck Cahn have been posting and tweeting videos wearing socks with crazy colors and designs. Using the hashtag #RockYourSocks, their videos have raised awareness for a local nonprofit. Cherry Hill West is one of three schools in New Jersey participating in Lt. Gov. Kim Guadagno’s “Rock Your Socks Campaign.” The campaign is a donation drive where socks are being collected for Covenant House New Jersey. Covenant House is a nonprofit providing shelter and services to homeless young adults between the ages of 18 and 21. 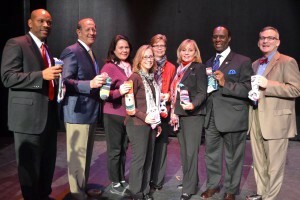 The sock drive is to provide those young adults with fresh pairs of socks. Jen Williams, a representative from Covenant House, talked to the students at an event last Wednesday and explained many of those who see Covenant House’s help do not have socks for everyday wear. “We’re going to be able to provide comfort to those kids’ feet,” she said. Cherry Hill West ended up participating after senior and board of education representative Tim Intelisano first heard from Guadagno about another project where he helped create a Twitter account for Cherry Hill West’s board representatives. Intelisano’s letter to Guadagno helped Cherry Hill West become the South Jersey school selected for the campaign. The other schools participating are Ridgewood and Ocean Township high schools. What has made Cherry Hill West stand out above the other two schools was the way it became a community project. Instead of just collecting donations, the school decided to make it a viral social media campaign similar to the ALS Ice Bucket Challenge from 2014. 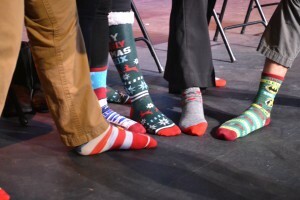 Community members were encouraged to post a video in crazy and decorative socks on social media, pledge to donate a certain number of socks in and then challenge someone else to do it. 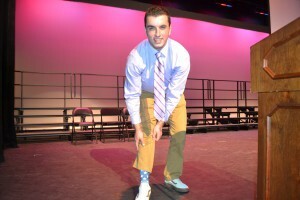 Intelisano helped spread the word around the school community, asking administrators, staff and students to create a video and tweet it using #RockYourSocks. The social media blitz allowed the campaign to grow from a school project to a community happening. Community leaders such as Cherry Hill West Principal Kwame Morton and Police Chief William Monaghan got involved, posting videos and encouraging others to do the same. Intelisano gave a lot of credit to Cherry Hill West student activities coordinator and Cherry Hill Township Councilwoman Carole Roskoph for getting influential people in the community involved. He felt having so many community leaders participating got students more interested. Last Wednesday, Guadagno visited the school to speak with the students about the campaign and to congratulate them on the donations they’ve collected so far. She felt the social media aspect of the project helped it to take off. Cherry Hill West’s social media campaign impressed Guadagno. Seeing many community leaders at last Wednesday’s event, she said Cherry Hill West did a great job making Rock Your Socks a community project, and she plans to encourage the other participating schools to get their community leaders involved. Guadagno’s comments about Cherry Hill West’s efforts were Intelisano’s favorite part of her visit. Rock Your Socks is continuing through the holiday season. So far, Cherry Hill West has collected about 400 pairs of socks and is quickly closing in on its original goal of 500. The school is planning to increase its goal to 1,000 pairs and will continue to collect socks through the holiday season. Community members who want to donate socks can drop them off at the main entrance of Cherry Hill West. Participants are also invited to post pictures and videos of their socks on Twitter using #RockYourSocks.